This is the WISE Announcements Archive page which provides a listing of announcements previously displayed on the wise.unh.edu page. 03.21.2019 - Because we do business with the government, Section 503 of the Rehabilitation Act of 1973, as amended (29 U.S.C. 793) requires us to reach out to, hire, and provide equal opportunity to qualified people with disabilities. To help us measure how well we are doing, we are asking you to tell us if you have a disability or if you have ever had a disability. Completing this form is voluntary, but we hope that you will choose to fill out the form located on the Personal Information page.The information you submit will be kept confidential. 03.21.2019 – As a Government contractor subject to the Vietnam Era Veterans' Readjustment Assistance Act of 1974 as amended by the Jobs for Veterans Act of 2002, 38 U.S.C. 4212 (VEVRAA), we are required to submit a report to the US Department of Labor each year identifying the number of our employees belonging to specified "protected veteran" categories. Completing this form is voluntary, but we hope that you will choose to fill out the form located on the Personal Information page.The information you submit will be kept confidential. 03.01.2019: On Friday, March 15, 2019 all exempt (salary) and non-exempt (hourly) employees will receive their paychecks on the same date. As of March 15th, 2019 paychecks will be effective every two weeks from this date forward. Additional information is available on the USNH Sharepoint site at: Payroll Cycle Changes (Exempt Employees) and Payroll Cycle Changes Student Employees. 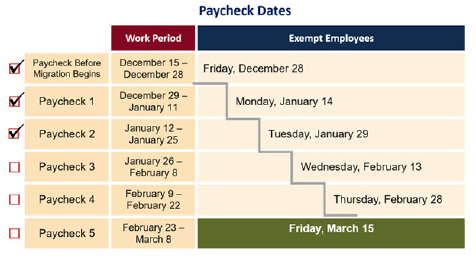 02.22.2019: As a reminder, the timing of paychecks for exempt (salary) employees over the first five pay periods of 2019 continues to gradually shift one business day until all exempt (salary) and non-exempt (hourly) employees receive their paychecks on the same date. Additional information is available on the USNH Sharepoint site at: Payroll Cycle Changes (Exempt Employees) and Payroll Cycle Changes Student Employees. 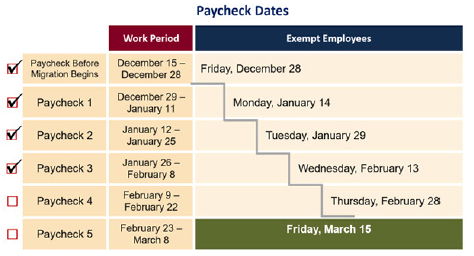 The next scheduled exempt (salary) paycheck will be Thursday, February 28, 2019. On March 15, 2019 - the 5th paycheck of the year, exempt (salary) and non-exempt (hourly) employees will receive their paychecks on the same date. 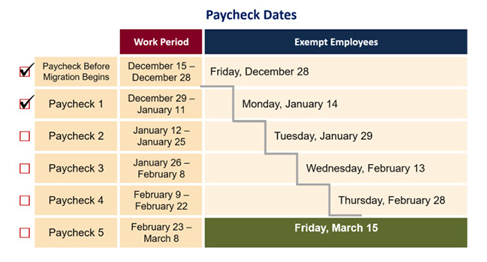 02.11.2019: As a reminder, the timing of paychecks for exempt (salary) employees over the first five pay periods of 2019 continues to gradually shift one business day until all exempt (salary) and non-exempt (hourly) employees receive their paychecks on the same date. Additional information is available on the USNH Sharepoint site at: Payroll Cycle Changes (Exempt Employees) and Payroll Cycle Changes Student Employees. The next scheduled exempt (salary) paycheck will be Wednesday, February 13th, 2019. 01.23.2019: The WISE landing page has been redesigned. The login icon is located below Announcements in the WISE Login area. Information previously listed on this page is now accessible via Helpful Links below. 01.23.2019: 2018 Electronic Forms W-2s are now available in WISE. From the Main Menu go to the Employee tab > W-2 Forms and 1095-C Information > W-2 Wage and Tax Statement > Answer: your security question > Submit Answer > Tax Year: 2018 > Display. The next scheduled exempt (salary) paycheck will be Tuesday, January 29th, 2019. 01.17.2019: It's a new tax year and W2s will be issued soon. Make sure you confirm we have your correct mailing address for tax purposes by going to the Personal Information tab and choosing View Address(es) and Phone(s). 01.17.2019: The WISE landing page has been redesigned. Information previously listed on this page is now accessible via Helpful Links below. April 10, 2018 - SmartAuth [USNH’s Multi-Factor Authentication Service] is now available to all employees accessing WISE. SmartAuth allows you to add an extra layer of security to protect your sensitive information and protects your account even if your password is stolen. You may already be using multi-factor authentication services to log into your bank account, email or social media accounts. If you would like to begin using SmartAuth when accessing WISE, you will need to register a phone number to receive passcodes. Visit SmartAuth Information & Registration Instructions for further details. While currently optional, beginning July 9, 2018 the use of SmartAuth will be required for all employees accessing WISE. January 23, 2018: 2017 Electronic Forms W-2s are now available. To access yours, select the “Employee” tab from the WISE Main Menu screen. The W-2s can be found in the “Tax Forms” area by selecting “W-2 Wage and Tax Statement” and “2017” as the Tax Year. These forms are not available in WISE. Electronic versions of the forms will be available by March 2, 2018 via MyUSNHBenefits.net under "Personal Documents". Per the current IRS guidelines for the 2017 tax year, taxpayers do not need to wait for Forms 1095-C before filing income tax returns, as individuals are not required to send the form to the IRS, but should keep it with their tax records. January 23, 2017 - Because we do business with the government, we are subject to certain governmental recordkeeping and reporting requirements. To comply with these requirements, USNH employees will be asked to voluntarily self-identify their ethnicity and race when logging into WISE. Providing this information is voluntary, but we hope that you will choose to complete the form. The information you submit will be kept confidential. September 29, 2016 - Because we do business with the government, Section 503 of the Rehabilitation Act of 1973, as amended (29 U.S.C. 793) requires us to reach out to, hire, and provide equal opportunity to qualified people with disabilities. To help us measure how well we are doing, we are asking you to tell us if you have a disability or if you have ever had a disability. Completing this form is voluntary, but we hope that you will choose to fill out the form located on the Personal Information page.The information you submit will be kept confidential. September 29, 2016 – As a Government contractor subject to the Vietnam Era Veterans' Readjustment Assistance Act of 1974 as amended by the Jobs for Veterans Act of 2002, 38 U.S.C. 4212 (VEVRAA), we are required to submit a report to the US Department of Labor each year identifying the number of our employees belonging to specified "protected veteran" categories. Completing this form is voluntary, but we hope that you will choose to fill out the form located on the Personal Information page.The information you submit will be kept confidential.